Where were you in ’79 when the dam began to burst? Did you check us out down at the local show? Were you wearing denim, wearing leather? Did you run down to the front? Did you queue for your ticket through the ice and snow…? I was fifteen and I WAS wearing the Denim and Leather Saxon was singing about. In 1979 I was finding myself. I had completely fallen in love with loud, fast, and dirty music. There was a local record store that was run by a guy who was what we would now call a “metalhead” and he quickly became a musical mentor to myself and the hooligans I was running around with. One day when we sauntered in to hang out and pour through the vinyl for treasures, there was a song playing that caught my attention. I asked the guy what he was playing and he said “Some band from England named Saxon, I just got the record in, it’s pretty good.” The song that caught me was “Big Teaser”, I bought my first Saxon record that day. That, my friends, is how I discovered the mighty Saxon. 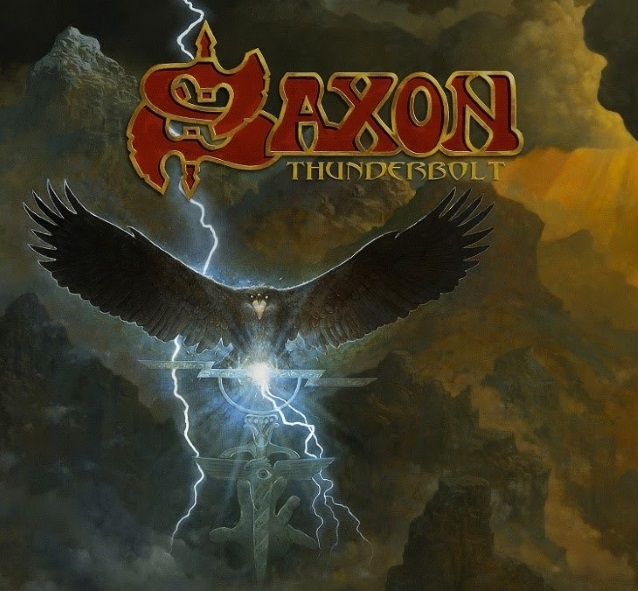 2018 finds Saxon Still going strong despite some lineup changes, (current line up is: Biff Byford – vocals, Paul Quinn– guitar, Nigel Glockler– drums, Nibbs Carter– bass, and Doug Scarratt– guitar), releasing their 22nd studio album Thunderbolt and plan to tour Europe and the UK with Diamond Head, Rock Goddess, and Magnum. They will also be supporting the legendary Judas Priest in the US on their Firepower Tour. Now, we can bore you to tears with facts and figures that you can look up for yourselves, or we can just tell you why we here at Metal Nation have chosen Saxon as our artist of the month. When a band can claim 41 years of making music, 22 studio albums, combined with untold numbers of fists raised in unison while screaming out the words to the many anthemic songs they have given us like “747 (Strangers in the Night)”, “Denim and Leather”, “Strong Arm of the Law” they deserve recognition like this. Personally I have followed Saxon through the years and currently own every release that has been issued. I still find myself pulling out the worn but well cared for first album I purchased so many years ago and finding it as powerful and invigorating today as it was to me back then. I am still wearing Denim and Leather, going to shows and running down to the front. Thank you Saxon for the music and memories you have given the world, Never surrender my friends, stand up and fight them all! it’s loud, it’s dirty, it’s SAXON! Check out our Rankings of all 22 Saxon studio albums. DUST BOLT Return To North America Alongside Obituary, Pallbearer and Skeletonwitch This Spring!